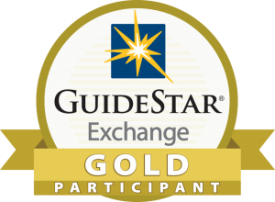 Alma and Micky have been working toward creating a better life for their family by building up their credit, saving money, going to school, and working to advance professionally. Despite their efforts, they have been unable to afford a decent and safe place to live and have been living in a small room with their son, Noah. On November 17th, Alma and Micky’s family celebrated a new beginning. 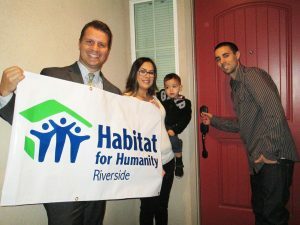 Alongside loved ones and new neighbors, they were presented with keys to their new home during a Home Dedication Ceremony on Roberts Way in Moreno Valley. 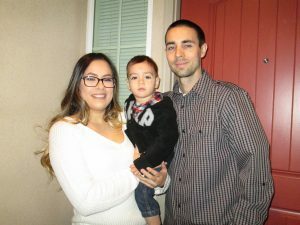 Having lived in Moreno Valley all their lives, they strongly valued the community they were a part of and hoped to raise their son in the area. 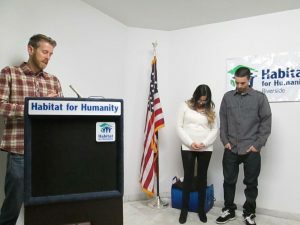 Alma noted that after she heard about the opportunity to purchase a home with Habitat, she felt like it was meant to be, “I prayed for the home every night”. The dedication was kicked off by Habitat for Humanity Riverside Executive Director, Kathy Michalak and Family Services Manager, Lauren Hahn. Nick Holst from Discovery Christian Church in Moreno Valley performed the blessing. 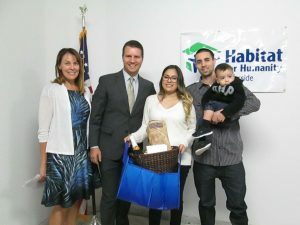 Habitat for Humanity Board Members, Maria Sambito and Nick Adcock presented the family with a welcome home basket. The labor of volunteers and partner families, efficient building methods, modest house sizes, and zero interest mortgage loans make it affordable for families to purchase Habitat homes. The home is Energy Star rated, and includes utility savers such as tankless water heaters and solar panels to keep costs low for the family. 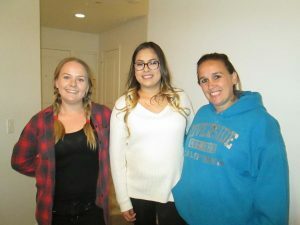 Alma stands with her new neighbors Rachel and Sheena, who moved into their Habitat homes on the same street earlier this year. Congratulations Alma, Micky, and Noah on your new home! This story was featured in our Winter 2016 Newsletter, for more on this story or to read the complete newsletter, click here! Help give families, like Alma, Micky, and Noah, a safe and affordable place to live by supporting #AHomeForAllSeasons. Donate today!